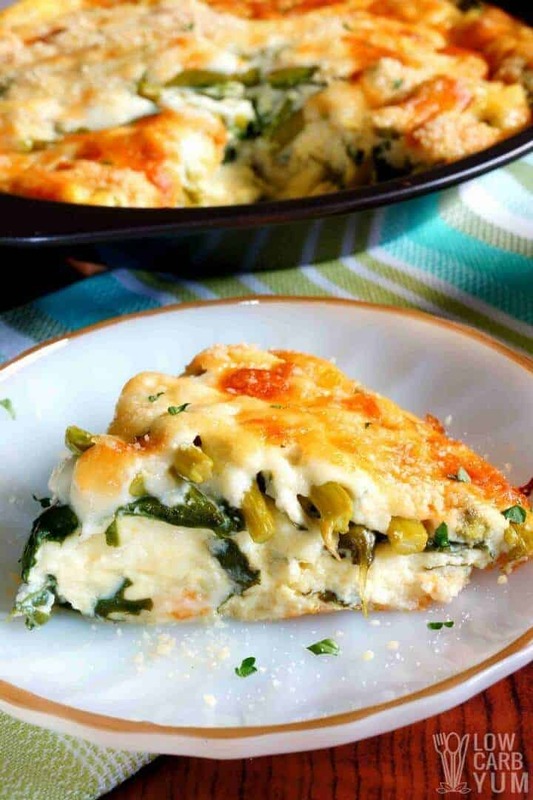 A crustless asparagus quiche with baby spinach leaves that’s simple to make. It’s a delicious morning treat with little effort involved in preparation. 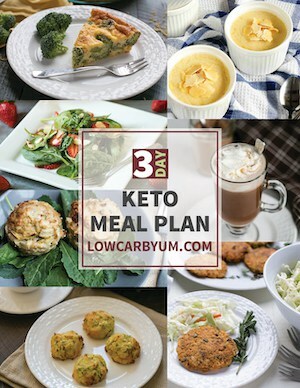 Since the beginning of the year, I have been following a strict low carb and low calorie diet along with regular exercise. I have lost over five pounds which is the few pounds I gained over the holidays and some extra. Right now, I am the lightest I have been in over twenty years. It could be a coincidence, but I had my thyroid medication switched from Armour to NP Thyroid on January 4th. Some of my quick weight loss could be from the change in my prescription. From what I’ve read online, NP Thyroid is a more effective thyroid hormone replacement medication when compared to Armour. I do feel better on the NP Thyroid, but may be slightly hyperthyroid. My doctor recommended that I wait six weeks before having my thyroid levels tested, so I will know for sure next month. I have been eating a lot of eggs over the last couple weeks during my weight loss period. I don’t always have time in the morning to cook eggs so I like to baked a crustless asparagus quiche to slice for quick breakfasts. Spinach and cheese is my favorite quiche, but I had a bag of frozen asparagus in the freezer and thought I’d give it a try with a little bit of baby spinach leaves. The result was delicious and a true morning treat with little effort. The quiche kept for almost a week in my fridge. I ate if for breakfast and a couple dinners during the weekdays. It tasted just as good leftover as it did freshly made. 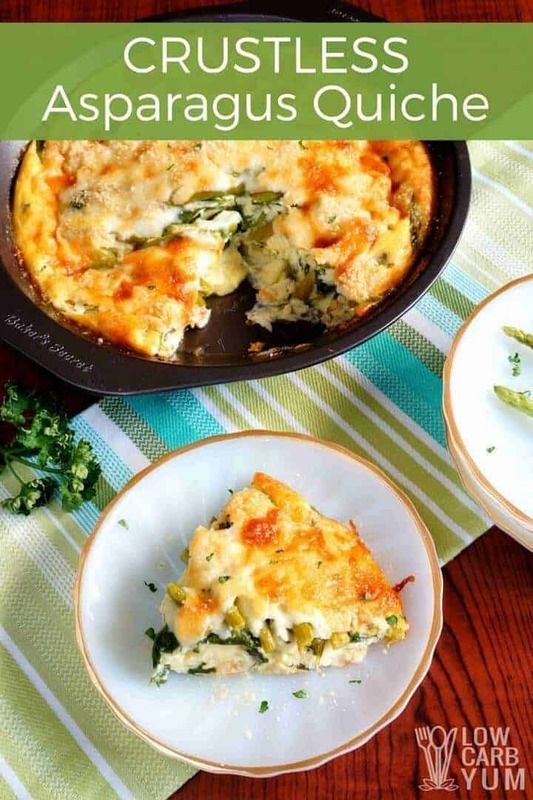 So, if you are looking for an easy low carb meal, just whip up this crustless asparagus quiche and you’ll get a whole week of meals. 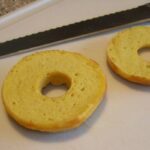 It should also freeze well if you’d like to store it longer. I used a blend of mozzarella and parmesan cheeses in the quiche. Feel free to change those up if you’d like. It’s just what I had on hand. But you can change up the flavor by using different cheese blends. Eggs are a staple for me on low carb. And, although I initially started to lose unwanted weight, I’ll be sticking with this way of eating for life. There are so many ways to cook up eggs, it’s tough to get bored of them. In fact, many people go on an egg fast to get into ketosis faster. I love them so much, I’ll eat them for dinner after work. 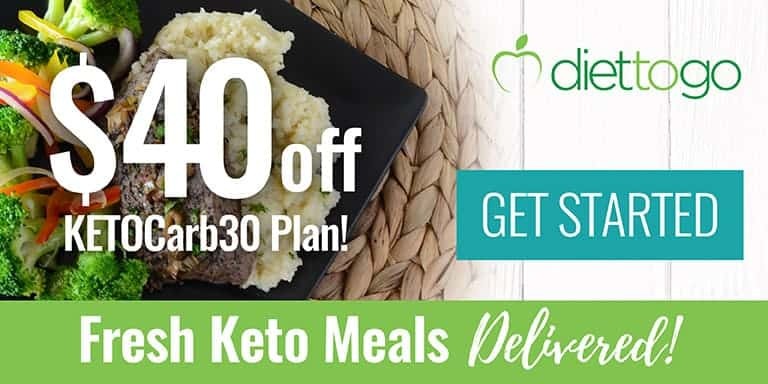 They make a quick keto meal. I like to make cheese omelettes with a little veggie mixed in. So, keep a good supply of eggs in your refrigerator. For induction and egg fast friendly recipes, check out this collection. And, if you’d like to try other quiche variations, I’ve also got an egg fast and a spinach mushroom quiche recipes on the blog. 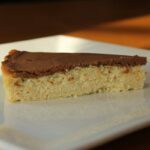 I hope you enjoy this yummy asparagus quiche as much as I did! You can even make a double batch and bake it into a 9×13-inch casserole pan. Just cut it up into squares. And, if you are looking for another easy way to use asparagus, try a prosciutto wrapped asparagus appetizer. 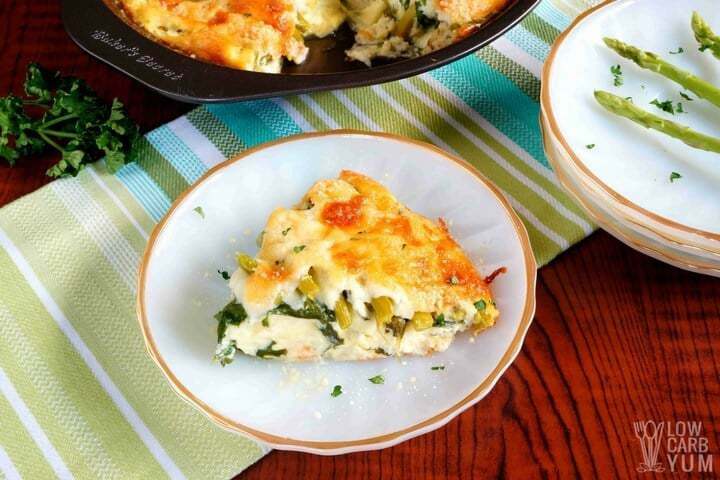 A crustless quiche with asparagus and baby spinach leaves. It's a true morning treat that takes very little effort to make. Reserve about 1/4 cup of the egg mixture. Stir spinach leaves in remaining egg mixture and pour into the prepared pan. 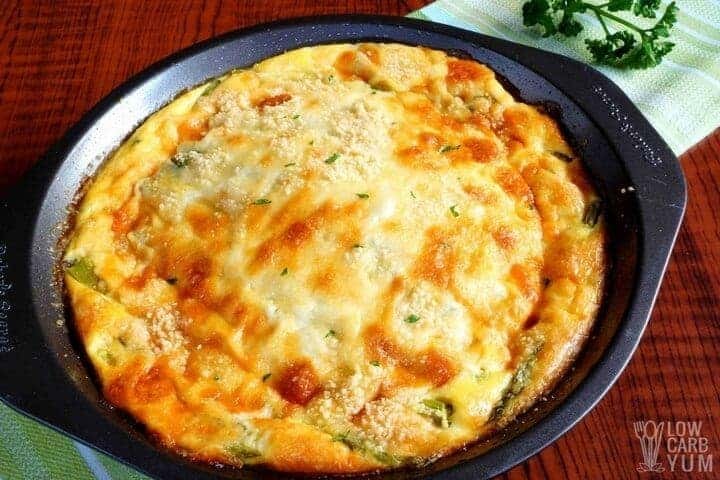 Layer asparagus on top of egg mixture in pan. Spring remaining 1/4 cup mozzarella and 2 tablespoons parmesan cheese on top. Bake at 375 degrees F for about 30 minutes or until edges start to brown. 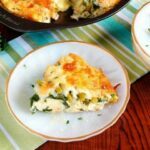 [post_content] => A crustless quiche with asparagus and baby spinach leaves. It's a true morning treat that takes very little effort to make. This is delicious, easy and was inexpensive with the ingredients on sale this week. I love that different veggies, cheese and spices can be used. I did not have quite enough mozzarella, so added some sharp cheddar. I used red onion instead of garlic and chopped the spinach and asparagus. I forgot to save some egg for the top, so beat 2 eggs and added it to the top. I had not measured the spinach (oops) and think I put too much, so the extra eggs were needed. Thanks for the recipe! I made some additions, substitutions, and have a suggestion. I added a sauteed shallot/garlic, chopped bacon and two tbsps of heavy cream to the egg mixture. I used white cheddar instead of the mozzarella. The flavor was outstanding. My suggestion is to chop the spinach…Leaving the spinach whole makes it difficult to cut (and eat) the quiche. Next time, I’ll also cut the asparagus in 1 inch pieces for the same reason. 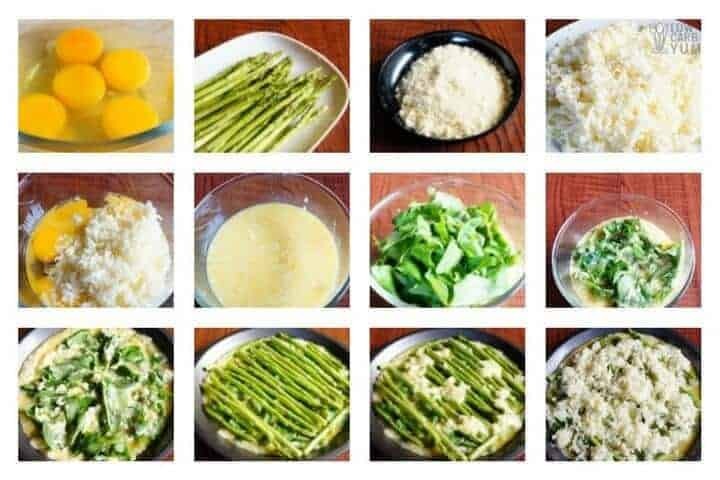 It won’t look as pretty, but asparagus is pretty fibrous and can be hard to chew. 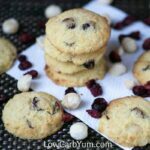 I miss the crust, but this is a great recipe when I’m feeling too lazy to make pie dough! This recipe is great. You can adapt it to almost anything. I fried bacon, leeks and mushrooms (no oil) instead of the asparagus and added 2 extra eggs. Came out totally scrumptious. Thanks for sharing. I’ve made this twice. Love it. How come in mine the top isn’t covered with egg as it looks in picture? I did use cheddar instead of mozzarella cheese. Hi I love your quiche recepies. They are lovely. It’s very difficult to make a quiche without eggs. There are some egg replacers that might work like the ones used for vegan scrambled “eggs”. Looks very delicious and it’s perfect for breakfast. 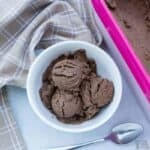 How can this have 2 1/4 cups of mozzarella (80 cals per 1/4 cup) and this recipe be 83 cals per serving? Have you checked your math? You’re right. I redid the calculation with a much more accurate calculator. Made it for dinner. Used kale instead of spinach and added bacon… Delicious!! Thank you. This looks yummy. I am looking forward to reading more about NP Thyroid. I am not familiar with that. Thanks for the recipe. I have been taking NP Thyroid for several years. I started on it after Armour was reformulated. I’ve heard that Armour may have gone back to the original formula, but not sure. NP is still working okay for me. This looks lovely sliced, the way you placed the asparagus horizontal to slicing. I’ll be trying this one.